I was tagged by Tammy from Mom Knows Everything. I think Tammy might possibly be just as meme crazy as I am ;-) . I played three sports in school. There was not a time of year that I was not involved in a sport. I played Volleyball, basketball, and softball. Volleyball was what my life revolved around though, and I desperately wanted to play in college. My highlight in basketball was when I made a four-point play (was shooting a three pointer, got fouled, and made the foul shot). I got a severe case of chicken pox my senior year. Those stupid chicken pox, coupled with strep throat, almost caused me to miss attending my graduation. It also caused me to drop from graduating 10th in my class to graduating 12th in my class (Yes, I'm still bitter). I don't think I will ever fit in as a conversationalist in this new area (especially with men) because I use proper grammar. I wish I had a dime for every time I stopped myself from correcting someone who just told me "We was gonna go n sees them, but they's ain't gonna be home, see." Oh yes, I see... I think. I've worked for three different bosses that I could have filed charges against. Now you can see why I appreciate and love my boss from Ohio so much. 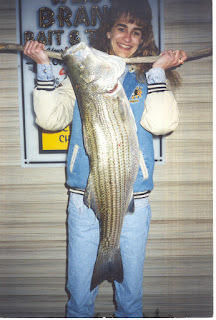 In 1998, I caught a 21.4 pound, 37 1/4 inch Striped Bass out of a local reservoir in Ohio. This catch got me on the front page of the local Field & Fish magazine (although my dad says that it didn't hurt that I was the only female in the whole magazine and that I had a big, proud smile on my face). It never fails though, any guy who walks into our house and sees my fish hanging on the wall, instantly turns to my husband to ask him where he caught that fish. That is when I stand myself up tall and step in between the sexist moron guy and my husband and loudly proclaim that I caught that fish. Wow, that's a huge fish. I've never caught a fish in my life. My husband enjoys fishing but we haven't done it as a family yet. I'm sure it would be a fun experience. Holy Bass!!!! That's a big fish!!! I'm not going to tell you the size of the biggest one I've caught. It's not quite as big as yours, but my husband does call me The Bass Master. LOL!!! I'm so going to show him this picture. You go, girl! That is a crazy big fish! Love the picture...you can really proclaim "I once caught a fish thiiiiis big!" HA! That is a stinkin' HUGE fish! Great catch!